Sturdy and robust for all occasions... Our hardcover Bibles are a wonderful way to present the word of God. You can feel the power in their weight. Economically priced assingle copies, enjoy even greater savings when you purchase them in case quantities. Many of these Bibles are also available in large and extra large print and are sturdily bound for a lifetime of praise and worship. We offer custom imprinting on most of our hardcover Bibles. These Bibles are available in a variety of languages including: Spanish, Farsi, Kurdish, Arabic, Portuguese, French, Thai, German, Urdu and Chinese. (Available languages change frequently) Most of our English hardcover Bibles are available in single copies or in bulk by the case lot. An affordable pew Bible is available with this NIV edition. Rich with many different features, it is a hardcover that displays larger text and yet is priced economically. An affordable and durable NIV hardcover, this text is ideal for outreach, Sunday School students, or as a way of introducing new readers. Great in case quantities for evangelism. Esta Biblia NVI encuadernada en tapa dura es perfecta para el uso personal y en la iglesia. El papel biblia blanco de alta calidad utilizado para su impresión permite una fácil lectura. Whether used for outreach or evangelism or for new readers, this large print NIV edition is crafted in hardcover and designed in single column. Comes in both single copy and by the case. A large print New International Version that provides a sturdy hardcover, single column format, and many guides. Priced per copy, it is also available in bulk for outreach or study. 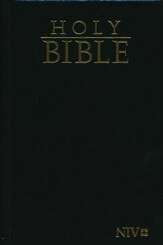 A hardcover, large print edition of the NKJV Bible. This edition is perfect for both personal use and pew/worship. This updated version is affordable enough for elder outreach. A high quality, large print edition of the New King James Version. This is well suited as a gift or for study groups and can be purchased singly or by the case. Young readers as well as people with vision problems appreciate the Giant Print of this NIV edition Bible. A hardcover with nice proportions, it is affordable enough for evangelism. A hardcover French translation of the Bible, this text includes maps, terms, and footnotes. It is designed for durability and yet is affordably priced singly or by the case. This NIV hardcover edition is priced for outreach and evangelism. Though a solid and well-made text it is designed for giving away and is available singly or in case quantities. Evangelical campaigns can get a big boost when you are able to give high quality NIV editions. These hardcover texts are well-made and yet affordable, whether singly or in bulk. Imagine the joy of giving new members or visitors their own hardcover NIV edition when they first arrive. It is possible with these quality pew Bibles priced just right for giving. A compact NIV edition, this hardcover travels well and is priced just right for sharing, outreach, and evangelism. Available in single copies it is also discounted in bulk. 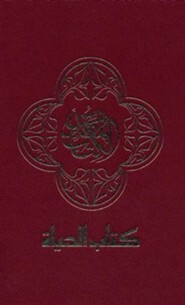 An elegant and beautiful Arabic translation of the entire Bible, this hardcover text features easy to read text. Available in single editions or discounted prices by the case. Whether for individual study or mission work, this Farsi language translation is beautifully designed and well-made. Available in single copies or by the case. This hardcover, NIV edition is ideal for beginning readers or those with impaired vision. Full of excellent features, it is affordable enough for outreach. The Giant Print Holy Bible, NIrV combines ease of reading a single-column text with a simple typeface, making it perfect for comfortable Bible reading and for bringing the Word of God into focus. Younger and older readers appreciate this Giant Print NIV Bible. This nicely sized paperback is easy to read, full of features, and priced ideally for outreach or evangelism. A long-lasting pew Bible, this hardcover NIV edition features larger print, maps and guides, and is ministry priced by the case or in single copies. Multiple colors available too. Larger print and durable bindings make these NIV editions ideal for study groups, pews, and as gifts. Hardcover and available in several colors, they are ministry priced in bulk. The NIV Church Bible is ideal as a quality pew Bible, but is also perfect for home study or for your church. A reasonably priced, quality brown hardcover pew and ministry Bible featuring a large 12-point font. An attractive and yet compact larger print edition of the NVI. This text is features a concordance and is designed for evangelism and affordability. Available singly or in bulk. A larger print, and yet compact hardcover edition of the NVI. This Bible is affordably priced for outreach or for study groups. Available singly or by the case for ministry.